FADED crimson-coloured plastic grape bunches droop from a plastic grape vine on the ceiling. 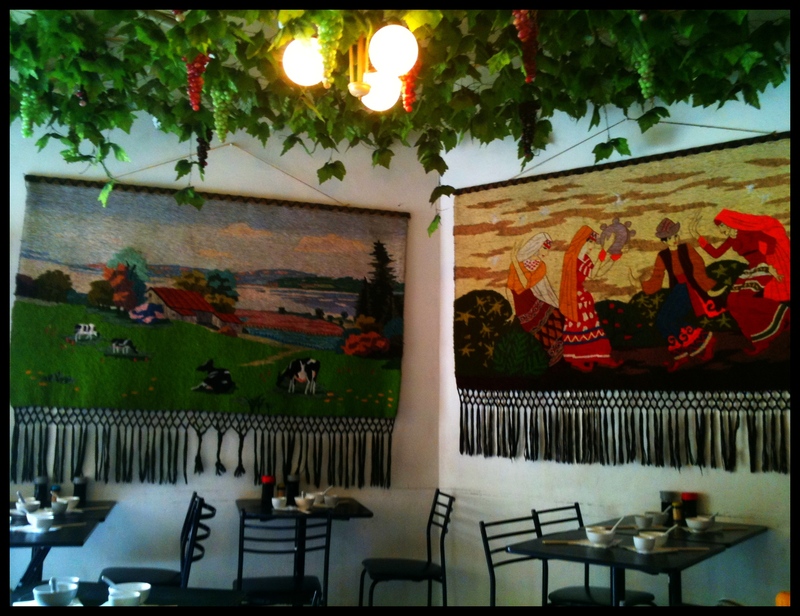 Colourful woollen tapestries depicting scenes from the Silk Road decorate the decades of tartare building up on the walls. One would think you have entered a bodega – not one of the cheapest and best Xin Jiang restaurants in Sydney. Xin Jiang is an autonomous region in north-western China and is mainly home to a Uigher ethnic group – the restaurant’s decor is typical of Silk Road eateries around the world. Simply named Chinese Noodle Restaurant, this small and non de script eatery which seats only about 30 diners on black laminate tables squeezed into its only room is in the basement of the Prince Centre in Thomas Street in Sydney’s Chinatown. I have arrived early – 10.30am (although it is open from 10am), for a feed of dumplings. I am the only one there but I know from experience that within an hour the place will be packed (and it’s been a while since I’ve been there and want a table). I am ushered to one of the tables for two and instantly greeted by a pot of Chinese tea and a dish of dried, mashed chili drizzled with some oil just to make it sticky. I ordered the pork and chive dumplings ($8.50) – they’re going to take about 15 minutes (made from scratch), so I quietly sip on my tea reflecting and watch as the ladies shred and shred. The menu offers a variety of dishes (some as half serves) the most notable to report being ma po tofu ($9.80); dry fried beans ($10.80); won ton noodle soup with hand made noodles ($8.80) and the braised eggplant with special sauce ($10.80), which I have heard good things about from colleagues. Out come two medium-sized steamers full of doughy dumplings (six in each) packed with a combination of minced pork, chives and diced garlic and ginger. These dumlings are not for prima donnas – they’re wonderful thick and their silky dough is chewy, holding in the juicy goodness that is extracted from the seasoned meat which squirts out when pierced. The filling is robust – garlic, ginger, chives – I can’t eat them all and take four back home with me in a container. Half serves are available at $4.50. I’ve decided to come back a week later as I yearn for Chinese Noodle Restaurant’s roasted lamb buns (even though it is 36 degrees outside). The two ladies are there – shredding chickens as they do and the master is stretching his doughy, silken masterpieces. The restaurant is also nearly full and it is not yet 11am. 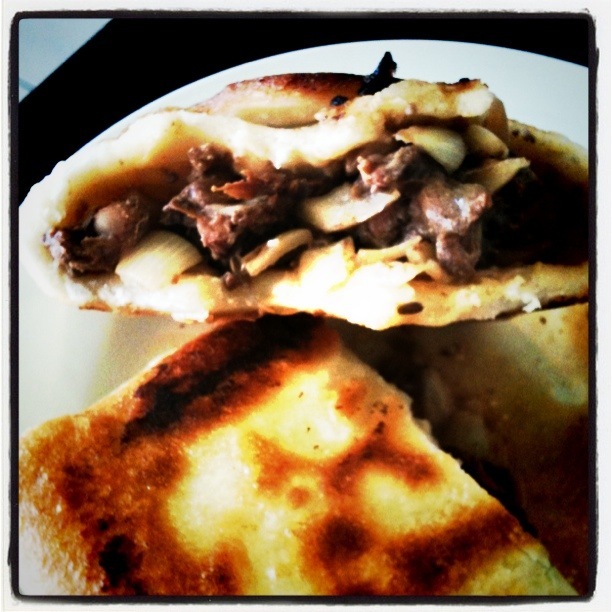 The roasted lamb bun ($5 for one or $9.50 for a pair) is a large square of thick dough that has been baked and finished off in a pan to get it slightly crispy on the outside. Inside it is packed with chunks of lamb and large pieces of onion – the mixture flavoured with predominantly cumin but there are hints of garlic and ginger. The meat gets cooked in the parcel so its juices and fats – intermingled with the cumin and other spices – ooze out when halved. It is a large bun that could easily be shared between two people. Chinese Noodle Restaurant is the kind of place that you can drop into to get a snack or quick meal with friends and will do take away. 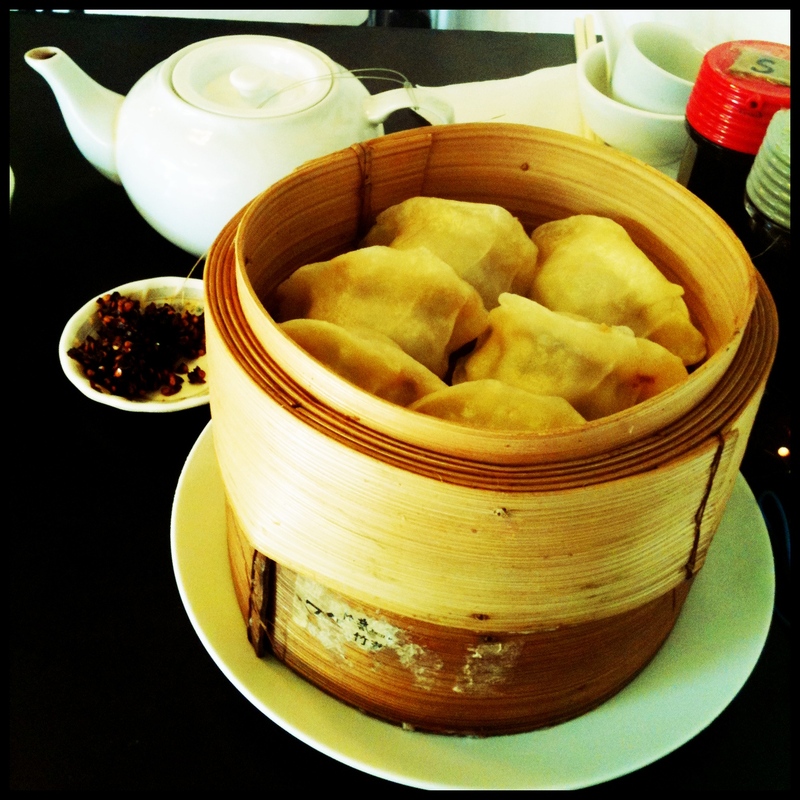 Best of all – the restaurant sells bags containing 16 frozen dumplings to take home (from $5.90). The verdict: Doughy, juicy and flavoured-packed dumplings and silken handmade noodles dishes at prices that are ridiculously modest for Sydney. What: Chinese Noodle Restaurant, TG7 Prince Centre, Thomas Street, Haymarket NSW 2000 Australia. Phone (02) 9281 9051. BYO. Ate there: 29 January and 5 February 2011. 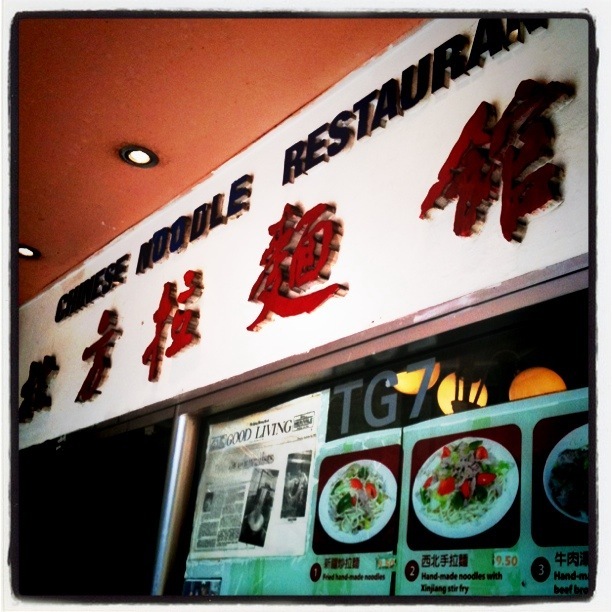 This entry was posted in Chinese, New South Wales, Street Food, Sydney and tagged Australia, Chinese, Chinese Noodle Restaurant, Food, Sydney. Bookmark the permalink.